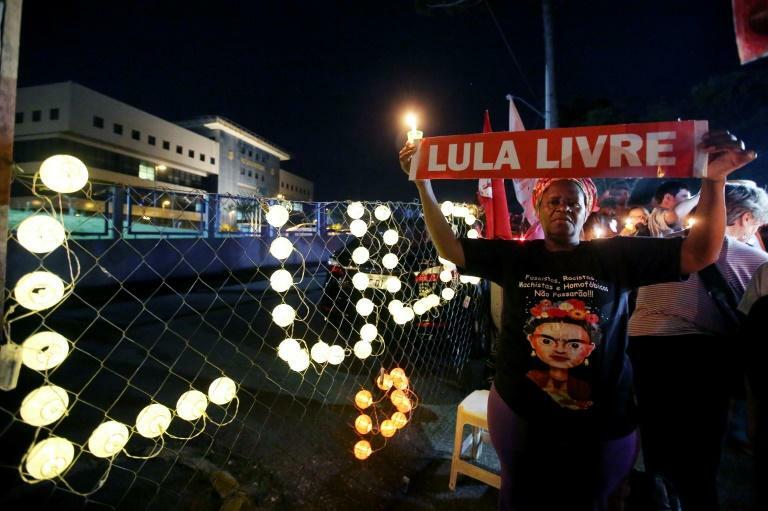 After a top Brazilian court disqualified ex-president Luiz Inacio Lula da Silva from participating in October elections, his party on Saturday was mulling whether to persist with their jailed leader or turn to his running mate. Following hours of debate on Friday, Superior Electoral Court judges voted 6-to-1 against the 72-year-old Lula's candidacy, hours before television campaigning for the fall election began. They gave the Workers' Party (PT) a September 12 deadline to find a replacement candidate for what is the most uncertain Brazilian election in decades. But the PT has vowed to "continue fighting with all means" to secure Lula's candidacy. On Saturday, Lula appeared in the party's television campaigning slot, which saw running mate Fernando Haddad promise: "We're going with Lula until the end." Haddad campaigned Saturday in Lula's native state of Pernambuco, where he vowed the party would maintain a political and moral stance in keeping with Lula's leadership "and the desire of over 50 percent of Brazilians." He is also set to visit Lula on Monday in the Curitiba prison where he is serving a 12-year sentence for accepting a luxury seaside apartment as a bribe from a construction firm. "The PT must readjust its strategy," columnist Tereza Cruvinel wrote in the Jornal do Brasil newspaper, but "nothing will be decided before the meeting between Haddad, other party members and Lula on Monday." If Haddad is named as the PT's candidate, Manuela D'Avila of Brazil's Communist Party will assume the running-mate position, according to a previous agreement between the parties. But unlike Lula, former Sao Paulo mayor Haddad commands little popular support. In the latest opinion polls, Lula was awarded 39 percent of voting intentions -- 20 points ahead of his closest competitor, far-right former military officer Jair Bolsonaro. Millions of Brazilians still adore him due to the prosperity the country enjoyed under his leadership from 2003 to 2010. On Saturday, former Argentine president Cristina Kirchner -- herself facing multiple corruption investigations -- expressed support for Lula. "Now they are preventing @LulaOfficial from being a presidential candidate because they know he would win October's elections," she tweeted.